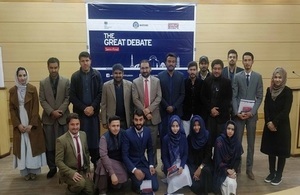 The British High Commission held the Balochistan semi-final for its fourth, annual GREAT Debate competition at the Balochistan University of Information Technology, Engineering, and Management Sciences (BUITEMS) today in Quetta. I am delighted to have held our first ever GREAT Debate event in Quetta. I have made four visits to Balochistan in my time here and I am pleased that we have now brought our annual debating platform to the students of this wonderful city. Our themes for this year’s GREAT Debate competition include trade, innovation, business and entrepreneurship which also serve as an important focus of our work with Pakistan in 2019. The UK is Pakistan’s second largest export market overseas and we want to see trade increase further between our two countries. I look forward to welcoming the winner and runner-up from Balochistan to the final in Islamabad.